White bean salad is a traditional Tuscan dish. In times gone by, Tuscans were referred to as Mangia Fagioli (bean eaters!) by their fellow Italians. That's because beans, and especially white beans, feature heavily in traditional Tuscan cuisine. White anchovies are one of my culinary "secret weapons"! Don't like anchovies? Are you sure?? Have you tried white anchovies? White anchovies and the brown tinned or jarred anchovies you usually come across at the supermarket or deli are actually the same fish. They have just been treated differently. The small brown anchovies have been preserved in salt for up to 10 months before being packed in oil. The salt preserving process turns their white flesh brown. White anchovies undergo less processing. They are briefly salted and then pickled in a mixture of vinegar and oil before packaging. White anchovies are much less salty and fishy than their brown counterparts. Giving them a 20-30 minute bath in lemon juice and zest makes them magical! Top with lemon juice and zest. Mix to combine and leave to marinate while you make the rest of the salad. Place all ingredients in a bowl and whisk to combine. 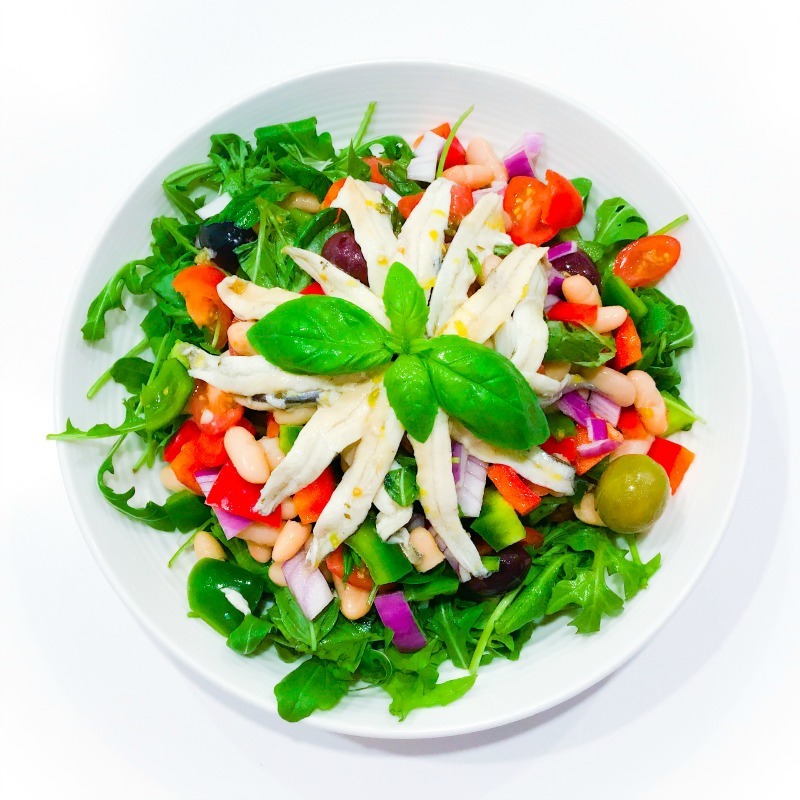 Place most of the marinated anchovies and all salad ingredients except rocket in a bowl. Add dressing and toss well. Arrange rocket over serving platter. Top with salad and garnish with remaining marinated white anchovies and a few basil leaves.